The Crowborough Magazine (formerly The Crowborough Directory) is an A5 magazine delivered direct through the doors of over 11,000 properties in the TN6 post code area every other month by Royal Mail. The Crowborough Magazine can increase your sales by promoting your business to the people who live and work in Crowborough and the surrounding areas. Over 11,000 copies are distributed FREE each issue to properties in the TN6 area by Royal Mail. It is packed with products and services that are provided by businesses in, or local to, Crowborough and is an invaluable reference point for every home. There are community sections where organisations can publicise local events or requests to the community; puzzles and other articles of interest. We will also be working with all the advertisers to bring you special offers or discounts where possible. If you contact a business you saw advertising in The Crowborough Magazine, please let them know you saw them here. If you own or work in a business where Crowborough forms part of your target market, then you should be advertising in this magazine! Next Deadline: Friday 5th April for the May/June 2019 issue. Please ensure all your contributions and new artwork is in by this time. 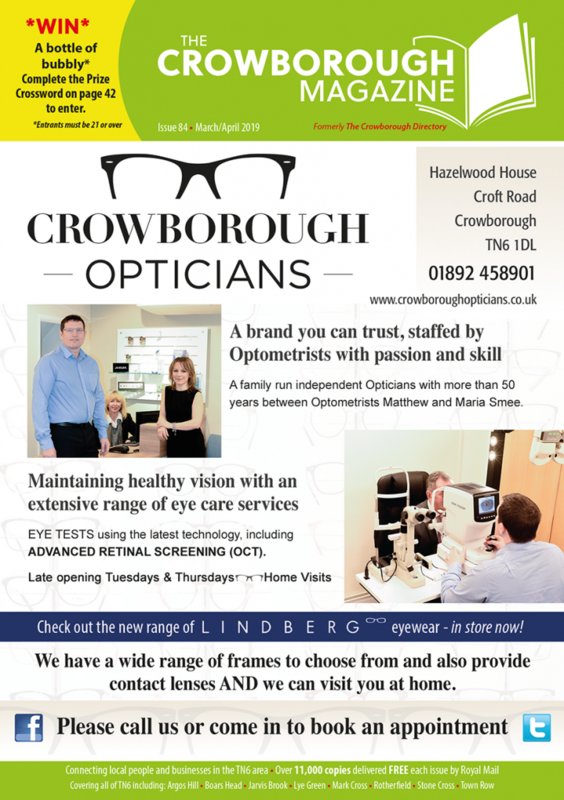 Call Laura on 07775 682 127 to advertise or email enquiries@crowborough-magazine.co.uk.